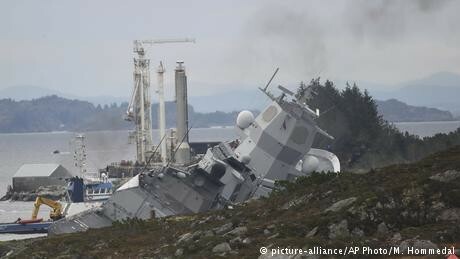 The Norwegian frigate KNM Helge Ingstad was rammed by the Maltese oil tanker Sola TS off the western coast of Norway early Thursday morning. The collision tore a large hole in the hull of the vessel, which began taking on water and had to be pushed into shallow coastal waters by tugboats to keep it from sinking. Some 10,000 liters (2,642 gallons) of ship's fuel and helicopter fuel is reported to have leaked into the sea. The Helge Ingstad's 137-man crew was evacuated. Eight crewmembers sustained minor injuries in the incident. The cause of the accident is unclear. The 250-meter-long Sola TS is thought to have inadvertently rammed the navy vessel after departing the Sture oil and gas terminal near Oygarden. The Maltese-flagged ship was loaded with crude oil en route to Britain. The tanker, currently in port undergoing inspection, was not damaged in the incident and none of its 23-member crew injured.